Last night Emalie and I went fishing with a friend on the private neighborhood lakes of Stonebridge, yet again. A couple bait casters were there before us, chuckin' their banana sized lures in every direction. Disappointed and fearing all the bass were either caught or scared to deeper water, I started pounding the shore nearby. Let me just say: I was glad I had my 6 wt. It is amazing the fight that a large bull red ear offers on the fly. 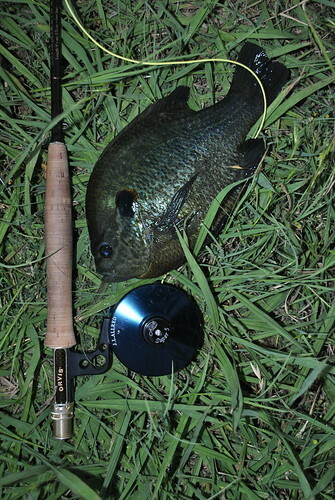 This is the Marion Barber of bream. Good bream are hard to find. 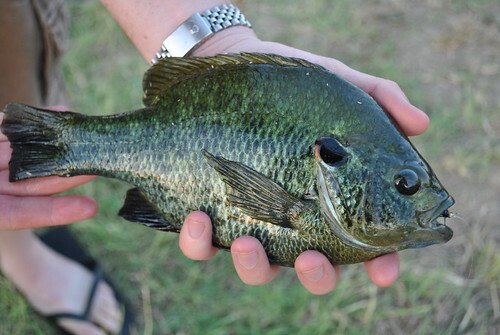 I am not talking hand sized, I am talking Frisbee hubcap bream. 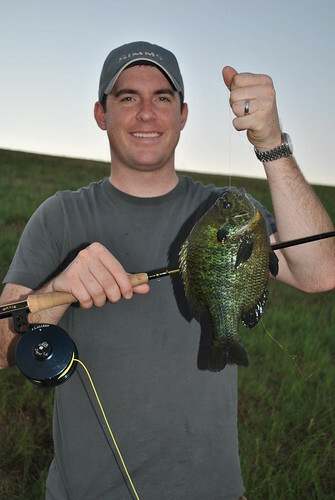 It takes a 3 or 4 years for a bluegill or redear to go from fry to 12 inch monster. 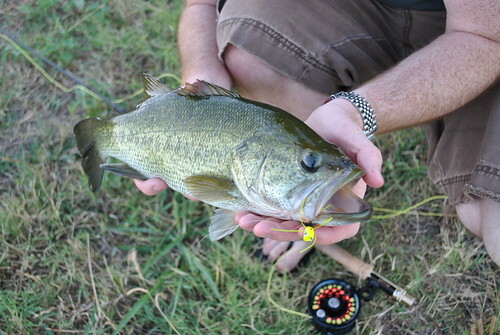 They face predation from all angles, but non more efficient than the angler. I don't like to preach. I practice catch and release and think others should as well. But there is nothing wrong with keeping a few fish now and then. 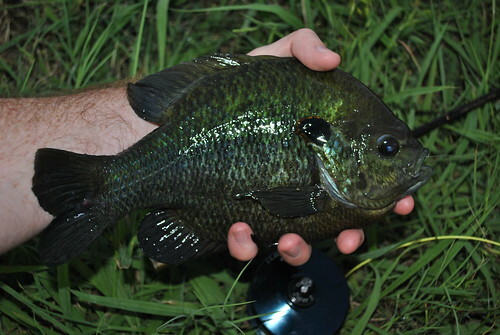 If you fish smaller lakes and ponds like I do, and you take home 20-30 "eatin" bluegills every time you wet a line, that shows a healthy measure of disrespect to the resource both for those others who fish recreationally and for yourself and your ability to repeat phenomenal catches of good sized sunfishes. So, in short, bragging that you took home 40 bluegills for the frying pan every other day makes you look like a douche bag. So stop. 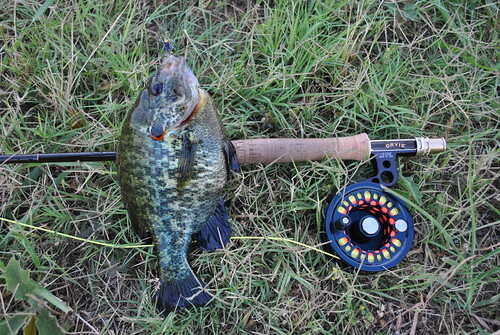 I agree the bluegill is a rewarding fish to catch on the fly. I have caught numbers on the black gnat, which is a nymph. If you will sent me your address I will mailed you a couple to try out. I know you like to catch the gills as much as I do.